Did you ever hear the story about Rollie Free? The guy who had the Harleys up that well known tree? Rolly was a racer and it wasn’t all talk. For he’d race you for money, marbles or chalk. Speed is what he lived for, records were his aim. And the way he’d work to get them, put the busy bee to shame. The origin of the tired phrase “A picture is worth a thousand words” is convoluted—and actually pre-dates photography—but it might be the first thing that comes to mind when seeing what is, arguably, the most famous motorcycle photo ever taken. You know the one: In black and white, a faceless white male is stretched out prone on a dark, exotic-looking motorcycle with minimalist form-fitting bathing trunks as his only article of clothing. The absence of visible spokes in the wheels suggests he’s traveling at speed, and a straight black line under the tires with stark white surroundings gives away the location as the Bonneville Salt Flats in western Utah. The distant Silver Island Mountains look as if they’re drawn in charcoal under the hazy, off-white sky. He’s not naked, but he’s also, relatively, wearing nothing. The brain bucket makes his ride legal and the size-12 plimsolls on his feet only make his sojourn from the mounting studs, where foot pegs used to be, to extended beyond the fender, just slightly more comfortable than if he’d been barefoot. The canvas coverings might also prevent the tops of his feet from being shredded by the tiny but jagged pieces of salt kicked up by the tire of the motorcycle. The sliver of white space between the gas tank and his face draws attention to the fact that he can’t actually see where he’s going and that the only indicator keeping him from drifting off course is the black line he must keep directly below. His rib cage points to the unique rear-suspension system and his gut follows the curvature of the rear fender. Not visible is the block of wood attached to the fender and squeezed between his bare thighs. His lower legs are extended beyond the end of the fender and his knees hover above the rear wheel, which is receiving a request from the transmission, via the 998cc twin engine, to spin faster. Faster! The goal: 150 miles per hour. For perspective, the wind speed of a Category 5 hurricane is 157 mph, a force that has touched the United States only three times since 1851. On the fuel tank, the Mobilgas Pegasus logo flies in the rider’s direction and the H.R.D. insignia indicates that the motorcycle is a Vincent, an innovative English marque. What we can’t see is the reason, the motive that drove a 47-year-old Midwestern-bred man—a former racer, dealer, Army Air Forces major, gas-station manager—to shed his protective gear in hopes of extending a motorcycle land-speed record that he, technically, had already earned earlier that same morning. “This is more than a motorcycle picture. It’s a picture of a man’s life,” said Jerry Hatfield, author of the 2007 book Flat Out! The Rollie Free Story, in his prologue. So it’s fallacious to consider that a photo—this photo—could be worth only a thousand, ten thousand, a hundred thousand words. This photo is an existence, a being, and a representation of one man’s life ambition. You would never know Roland R. Free just by looking at this photo, yet, simultaneously, without this photo you would never know Roland “Rollie” Free. If not for Hatfield, Rollie’s—pronounced with a long O, like “holy”—life story would probably be folklore, limited to the day on which he was the subject of the Bathing Suit Bike photo—specifically, September 13, 1948. But even Hatfield admits he almost missed his opportunity. With timing that was either impeccable or accidental, Hatfield had driven nearly 90 miles from Edwards Air Force Base, where he was stationed, to Bud Ekins’ shop in North Hollywood, California, to shoot photos for his first book, American Racing Motorcycle. It was Saturday, September 13, 1980, exactly 32 years after the now-famous photo of Rollie Free was taken at Bonneville. A man named Mike Parti visited the shop while Hatfield was working and a conversation about Indian motorcycles was struck; Hatfield became an authority on Indian motorcycles and their history, and the majority of the 16 books he has authored have been about the Springfield, Massachusetts, brand. Parti said if Indian was part of the book, then Rollie Free absolutely had to be involved. When Hatfield learned Rollie lived only two miles away from Ekins’ shop, he was dumbfounded. He thought Free lived in Indianapolis, where he once ran a successful Indian dealership. Hatfield said that at one point he was in the Midwest for interviews and photos and regretted not making time to seek out Free. The next morning, Free answered the door, skipped the preamble, and launched into motorcycle-related anecdotes. Hatfield laughs about it today and says he had to put his subject on pause while he sat down and set up his recorder. He missed a few minutes of conversation, stories he regrets he didn’t get the chance to follow up on later. For the next 15 years, Free chipped away at Harley by being an excellent mechanic and tuner of Indian motorcycles, then a representative for the brand, covering four states, then as a dealer in Indianapolis. He heckled those loitering in front of Harley-Davidson dealerships and sought out challenges and races any chance he got, but his most publicized coup was his pair of land-speed records in 1938. In Daytona Beach on St. Patrick’s Day, Free took down two Class C (owner-operator) records despite a choppy post-storm beach surface and crosswinds between 14 and 17 mph. He rode a stock Indian Sport Scout 45 to a two-way average of 111.55 mph, beating Harley’s record by 9.5 mph, set only one year earlier. He also ran a stock Indian Chief 74 at 109.65. Both were set riding in the flat-out position, of course, but Free was bummed at the 45-cubic-inch record because he’d promised his wife, Margaret, that he would smash Harley’s record by 10 mph or more. The Class A record, also set in 1937 by future Hall of Fame Harley-Davidson racer Joe Petrali, was 136.183 mph on a 61-cubic-inch (1,000cc) Knucklehead. The right bike—and opportunity—didn’t roll Free’s way for a dozen more years. It had to be 150. The temperature was creeping toward 80, the salt was getting moist, and it wasn’t yet 8 a.m. on the unseasonably hot September day in 1948. Harley-Davidson’s record was gone, eclipsed an hour earlier by nearly a dozen clicks, but 148-plus didn’t have the same panache as saying 150 mph. Rollie Free, now a 47-year-old gas-station manager living in North Hollywood, didn’t need to keep trying. Maybe he remembered coming up short of his Class C goals in 1938 and vowed not to settle. Whatever the justification, Free stripped his wind-tattered leathers and removed all clothing except for tight swim trunks because he thought he could cut the wind resistance even more and hit his mark. He borrowed a two-sizes-too-big pair of rubber-soled shoes and donned a bowl-shaped helmet that would pass Snell ratings about as well as a Styrofoam cooler. 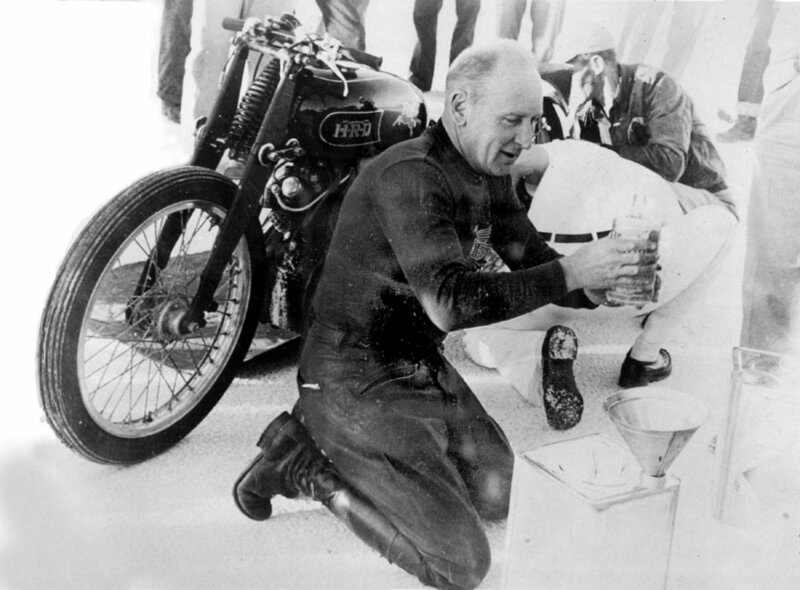 With his pasty white legs exposed, Free straddled the stripped-down 998cc prototype Vincent H.R.D. Black Lightning, which was owned by John Edgar, a wealthy journalist/photographer and motorsports enthusiast who wanted to be able to claim he owned the fastest motorcycle in the world and rode it recreationally. Free took on the mountains of paperwork to make the record run a reality and made the final adjustments when the bike arrived in Long Beach, California, via boat. The headlight, tachometer, speedometer, seat, brakes, kickstarter, and even the tiny cylindrical foot pegs, which would seemingly be innocuous against the wind, had been removed. The handlebars had several inches hacked off each side and the only additions to the bike were stronger rear-fender supports and the block of wood for Free’s thighs. The fuel tank had enough alcohol in it to make a two-way attempt. On his fourth and final push for 150, Free left the paddock, white flesh against black metal, his toes clinging to find a place to rest on the foot-peg mounting studs. A Vincent motorcycle is an engineering anomaly. The late-1920s brainchild of engineering student Philip C. Vincent, who later hired a chief engineer named Philip Irving, the Vincent H.R.D. twin—Howard R. Davies was a British Royal Flying Corps Pilot and Isle of Man TT racer—could hit 125 mph out of the crate. Its design, using the engine as a stress member, meant that there was no frame in the traditional sense; the engine hung from a spine. The package was decades ahead of its time and the sound was guttural, angry, even scary. Although the bike Free was on could hit 90 mph in first gear, it had impeccably smooth handling. Heading north toward the speed trap, Free moved into his streamlined riding position at 130 mph, pressed his left cheek against the back right corner of the fuel tank, opened the throttle to the limit, and kept the black course line directly beneath him. At the turnaround, he stopped and took off his helmet; his one-mile speed-trap time was 24.00 seconds—150 mph exactly—but being miles from the referee, he didn’t yet know that. He handed the helmet to a friend who had followed in the chase car and he was given Margaret’s swim cap in return; Rollie would have shed a layer of skin if he reasonably could have. Streaking southward through the speed trap, his cheek pressed even more firmly into the tank without the metal lip of the helmet impeding his positioning, Free clocked a 23.90-second mile, 220.9 feet per second and 150.6 miles per hour. 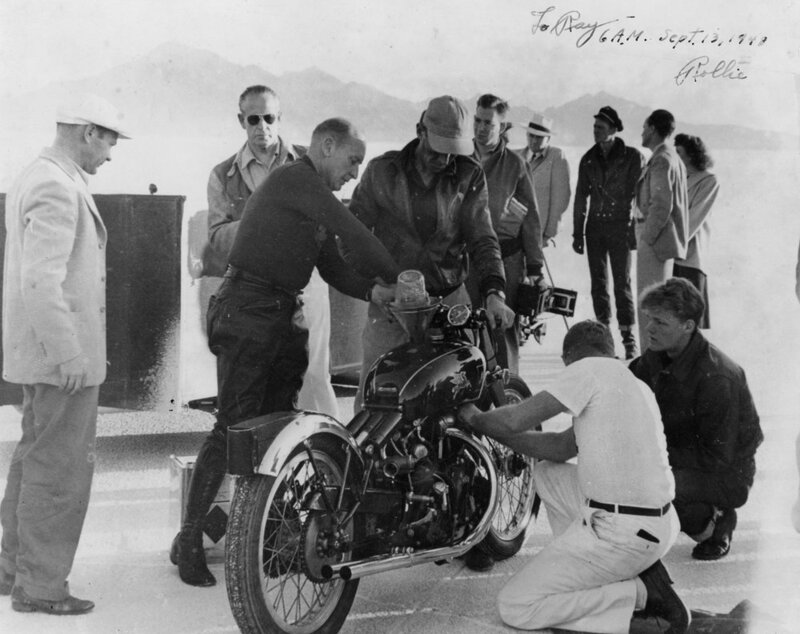 His official and final reading (two-way average) was 150.313, ending Harley-Davidson’s 11-year-long reign over the Class A national land-speed record. Free had ridden an un-supercharged motorcycle faster than anyone in the world. The news was in that evening’s editions of the Salt Lake City dailies and the Chicago Tribune, Indianapolis News and Indianapolis Star the following morning. The October 4 edition of Life magazine featured a half-page photo and caption, titled “Fastest Motorcyclist.” The photo chosen, opposite a Campbell’s Soup ad and above two snapshots of other American oddities, was an aerial view of Free from one of his first three attempts while he was still in leathers. The Bathing Suit Bike photo appeared on the cover of the October 1948 edition of Motorcyclist. After decades of toil, Free got his record and his revenge. John Edgar got his bike. Vincent H.R.D. had validation to continue marketing itself with the motto it had already been using for years: “The World’s Fastest Standard Motorcycle. This is a Fact Not a Slogan.” Unfortunately, the company from ceased production in 1955. Photography is so ubiquitous today. We may scroll and scan through hundreds, thousands of images in a single day on our mobile devices, rarely slowing our frenetic thumbs long enough to really look at most photos. Today, a photo like the one of Free might just be dismissed as another shameless grab for likes and followers. But the patina that oozes from the iconic moment, captured nearly 70 years ago, still resonates, still holds meaning. While there were several more trips to Bonneville, where he ultimately extended his own record, and many more photographs taken, Free’s life is frozen in one instantly recognizable frame. In his diary, Free wrote the most scant entries for what would be his most well-known achievements. He probably never planned to write a memoir. That was Jerry Hatfield’s job, something Hatfield spent more than a third of his life completing. “I was a local yokel who was very lucky,” Free told Hatfield in their only interview. There it is. Free lived a life worthy of being immortalized by Hollywood but was careful not to overrate himself. Like a vet from WWII, Free was just doing what he had to do. He didn’t go out of his way to talk about it. Humans will always push boundaries; Free wasn’t unique in this way, but an endeavor like his could never happen again. Riding-apparel rules aside, stunts do not happen today without a full contingent of video-production equipment—on and above the ground—a gaggle of photographers, and dozens of camera-phone-wielding gawkers. Rollie Free’s accomplishments can’t be duplicated because the simplistic quaintness of the era doesn’t exist anymore. No matter how many vintage bikes get restored, hipster beards are grown, and photographic recreations are shared, that world is gone. And that’s what makes this moment, that photo, that much more special.